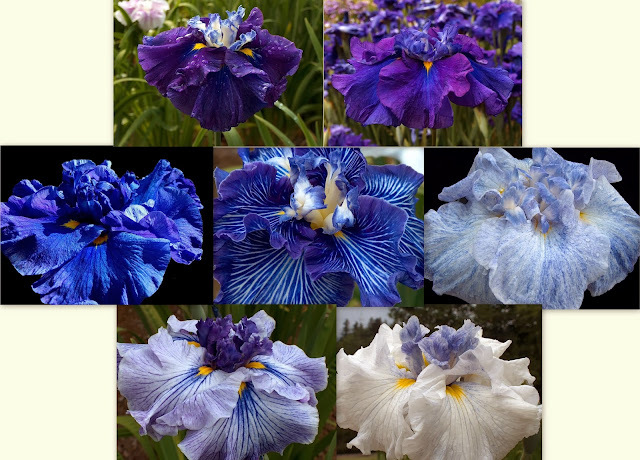 Here's another wonderful issue of IRISES, the Bulletin of the American Iris Society that will be arriving at your doorsteps soon. 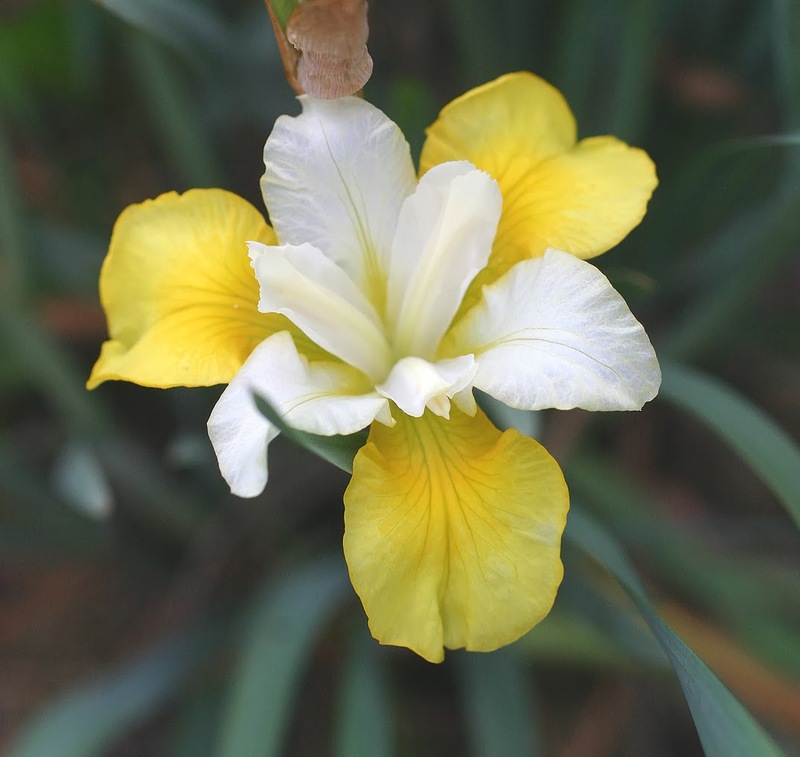 As you can see from the cover, it is gorgeous and bright yellow, 'That's All Folks,' by hybridizer Bill Mariott, the tall bearded iris winner of the 2013 Dykes Medal. "The north wind doth blow and we shall have snow . . ." I forget who wrote that, but it was what the weatherman forecast for yesterday. And, is so often the case, he was wrong. No snow, after all. BUT, he also forecast temperatures in the mid-20s for last night. That, I had to take seriously. 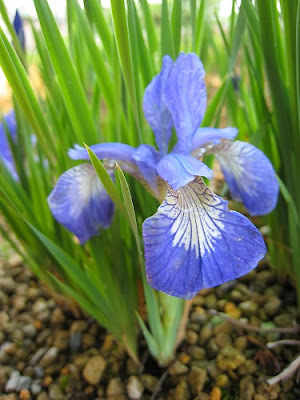 Sad news for the several reblooming seedlings in the garden and for others which had stalks up but hadn't yet bloomed. They'd be frozen by this morning. Such early freezes are unusual here. We had a lighter one a week ago, but socks on buds protected everything. Last night, however, we faced the grim reaper. 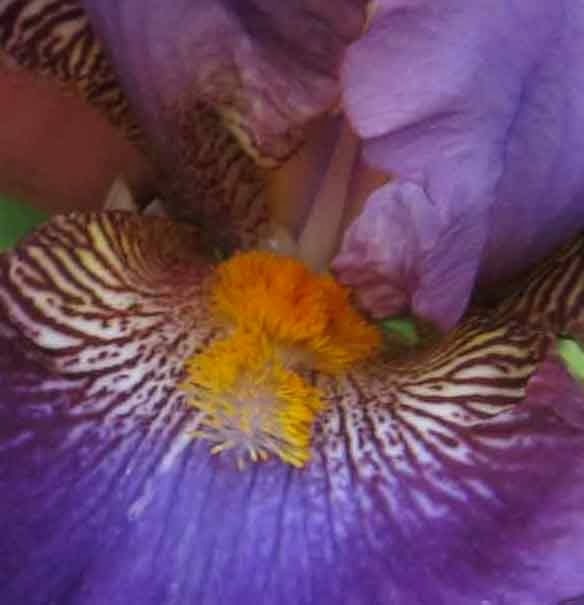 So, I reluctantly cut a handsome stalk of sdlg 092U15, which I have already seen in bloom, and brought it inside to grace the table, but there were stalks up, in the garden, of two other seedlings which I have yet to see in bloom. These, I wanted to see, if possible. So, I tried a trick I've used successfully in the past: tenting. Next, I take an old hooded sweatshirt and place it over the tomato frame, after having bent down the top wires so that the hoodie clears the top of the stalk and fits all the way to the bottom of the frame. That done, I slip a sturdy plastic trash bag over the hoodie. I then run an 80-foot outdoor extension cord from the house (or any other electrical source you might have in or near the garden), to which I attach a string of Christmas tree lights, with only three sockets containing bulbs. (You may want to wrap each empty socket in plastic wrap to keep moisture out, or fill those sockets with dead bulbs, if you have that many.) 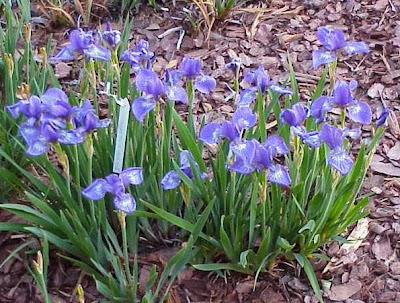 I place the three bulbs around the base of the plant, trying not to touch the foliage. Then I plug in the cord (or flip the switch, whichever). And, voila! Heat! Yes, the garden may look like Halloween, but the plants will be happy. Notice, in the next photo, how the bags have partially puffed up as a result of the trapped heat. In the morning, when temps have risen above freezing, remove the plastic bags and unzip the hoodies so that the plants receive light. What the well-dressed iris wears for those cold nights. So that's it, until the next freeze is forecast, when I zip up the hoodies and put the bags back on. In the meantime, I leave the lights lit until the flower blooms. 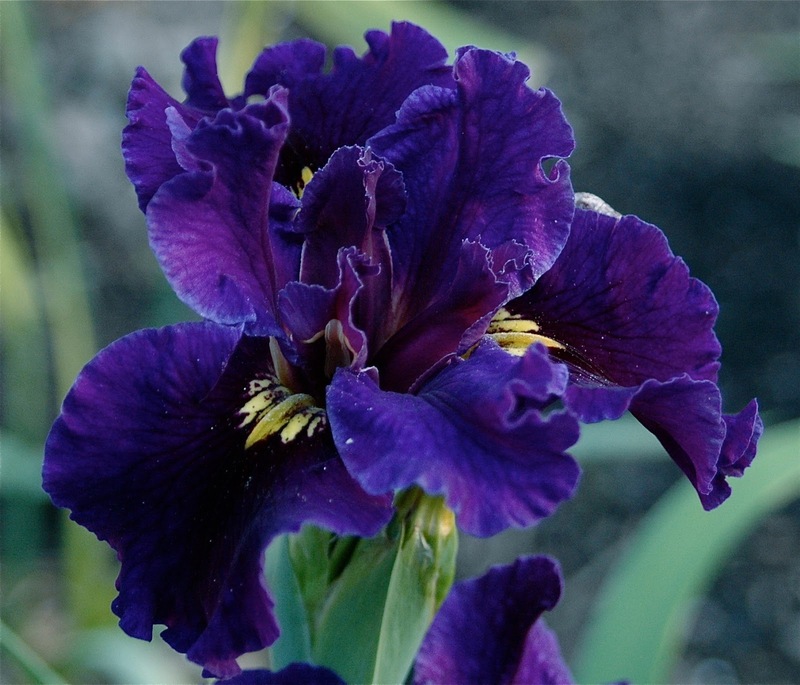 Whether you're looking for 'C’est Fantastique,' 'Cajun Cookery,' 'French Quarter,' 'Bayou Bluebird,' 'Big Easy,' or 'Red Velvet Elvis,' you know you've made it to Louisiana iris heaven if you make it to New Orleans for the Society for Louisiana Iris Convention. 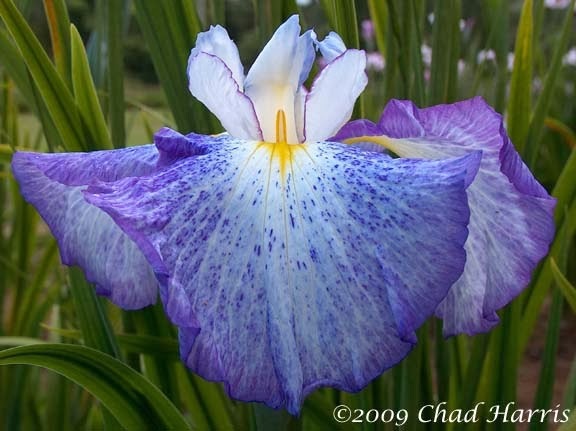 I'm excited to extend a cordial invitation to all of you to take part of the 2014 Society of Louisiana Iris Convention. Louisiana irises offer so much in terms of color and form, and are such a feast to the eyes, it is only fitting that it would be held in the diverse and colorful city of New Orleans. Patrick O'Connor, the Convention's Chair, put together an outstanding website, and one has to only look at the Tentative Schedule and Program to find that it will be an SLI event not to be missed. 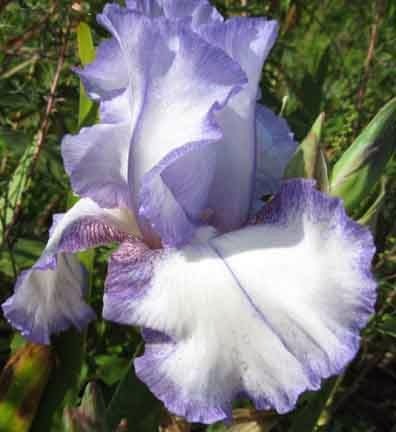 I am personally looking forward to a very scholarly part of this Convention -- the Symposium, a talk by Benny Trahan about Louisiana iris in the wild and its native habitat. Patrick says about Mr. Trahan: "No one today has more extensive experience than Benny Trahan in observing Louisiana irises in their native habitats. 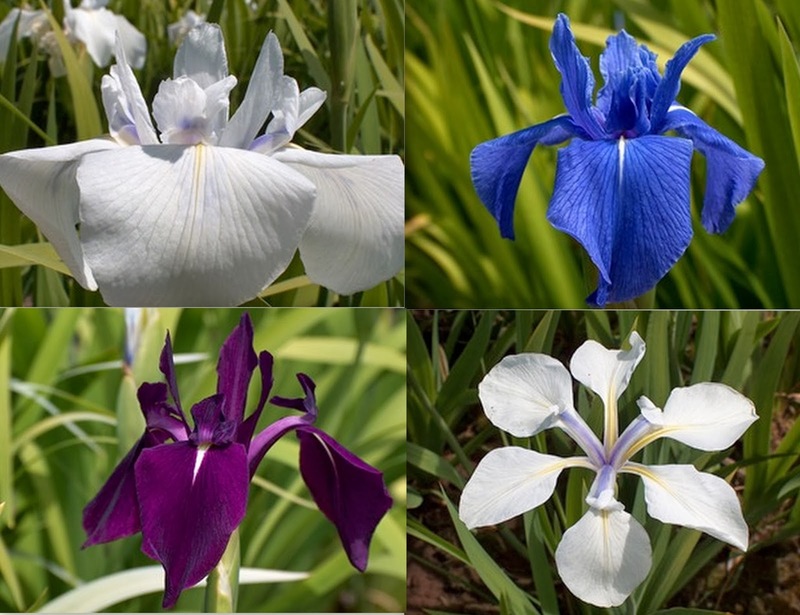 He has systematically traveled the state with topographic maps leading him to places where the terrain would indicate the possibility of iris populations. Benny has studied fulvas, giganticaeruleas, brevicaulis and, his specialty, the nelsoniis. For comparison, he traveled to Florida to observe I. hexagona in its various forms. " As in most iris conventions, the schedule will also include fantastic garden tours, an iris show, and judges trainings, but most importantly if you attend you will be part of a "fortunate" group that will see these events take place at the New Orleans Museum of Art, the New Orleans Botanical Gardens, The Sydney and Walda Besthoff Sculpture Garden, and the Longue Vue House and Gardens. 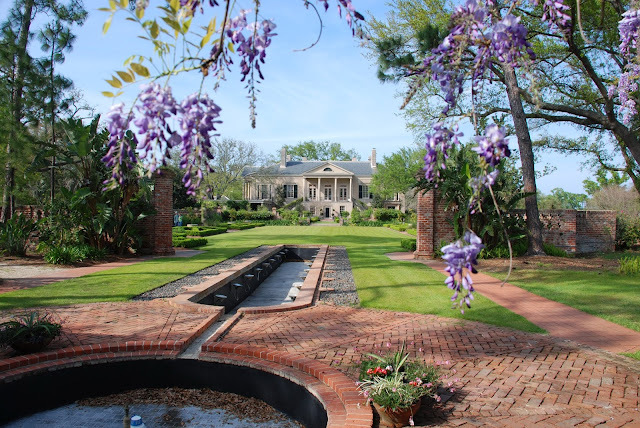 Imagine, to visit all these beautiful locations plus Louisiana irises in full bloom! Be sure to browse through the full SLI Convention Program, where you will find extensive information you won't want to miss. Also, for updated information follow the Greater New Orleans Iris Society's Facebook Page. 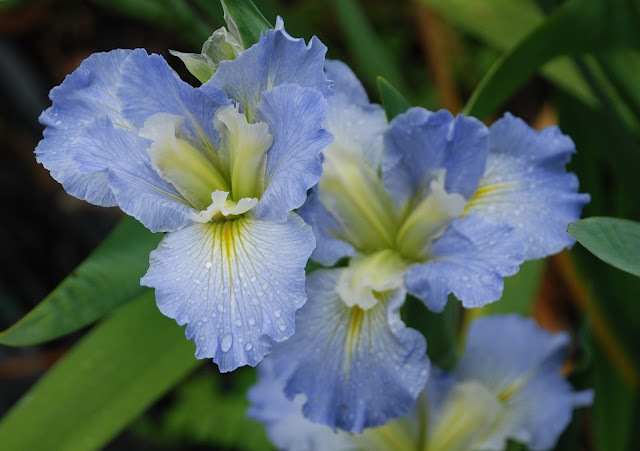 After the Fall Freeze 2013 . . .
It’s been an interesting year at Bridge In Time Iris Garden. Despite a fall freeze, and my inability to get into the garden much lately, some rebloomers have shown their beautiful faces through the weeds. I have not fertilized for the past two years either, which has had an effect on the garden. Weather was good for rebloom, but only a few faithful bloomed this year. Most of the larger, bloom-sized rhizomes were dug and sent around the country earlier this year. 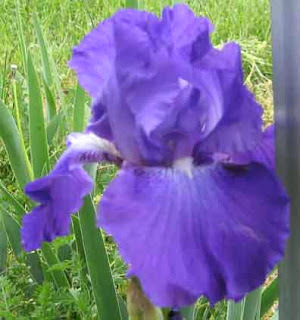 I have reports of some of these reblooming already in other areas. Bloom began here in late August with 1907-10Re. 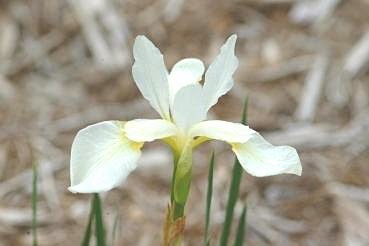 In 2011, this was one of the two seedlings that bloomed all summer, but this year it didn’t show its beautiful face until late summer. It was a welcome sight. Pretty as it may be, it does not always grow tall enough, and it's PURPLE. 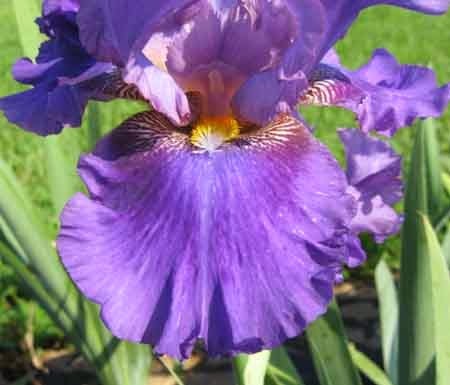 Purple is a common color in reblooming iris. Would you buy it? 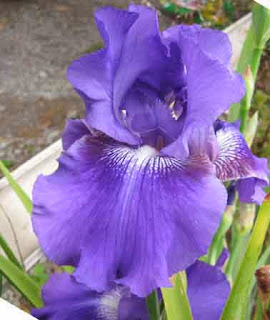 Currently, 'Over and Over' is one of the most dependable rebloomers in my garden. It wasn't the only one to rebloom in this difficult year, and it wasn't the first one to rebloom, but it did, and faithfully. I've discussed this with other breeders and many have said they won't use it because it isn't pretty enough, but I'd like to remind everyone that it is a really strong rebloomer. Furthermore, when crossed on self irises it will not give plicata coloring. Toward the end of the season, but with plenty of time to open well, '2150-02Re' put up stalks. This is from 'Star Gate' X 'Matrix'. Many seedlings from this cross rebloomed, but this one blooms the earliest and is most dependable. Again we have the "dependable" quality, but not early enough, and PURPLE. 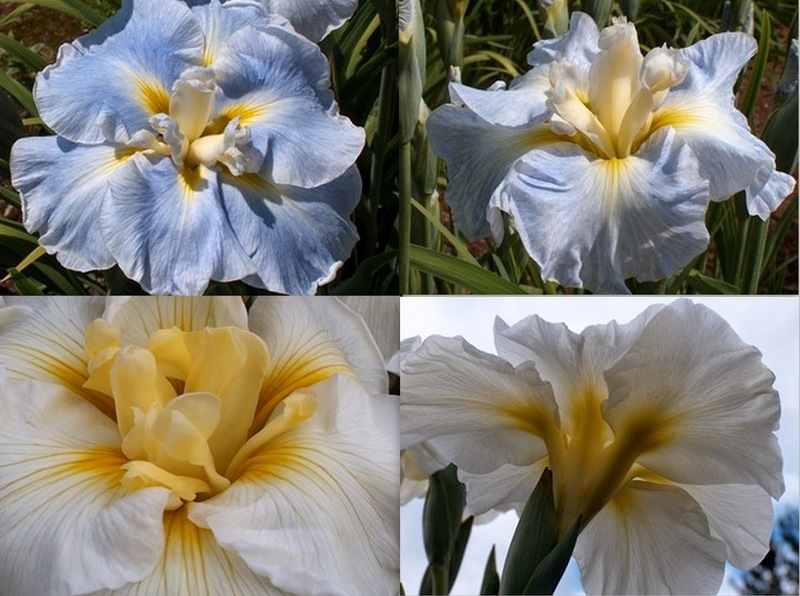 'Star Gate' is a dependable rebloom parent, but tends to breed only white or blue/purple with an occasional plicata. Most often, this seedling will maintain the good fall form and also show an apron pattern like picture 2. Some might wonder why I've not made a cross between the two purple rebloomers. Up to this point in time, I've not wanted to mix the beards. 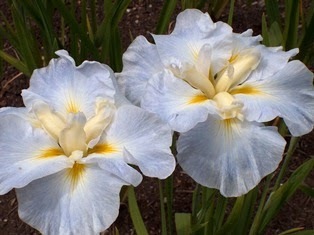 '1906-10re' has many siblings and about a dozen have rebloomed. Same is true with '2150-02Re.' With their parentage most of the seedlings would be purple and white plicata. Then there is the question on beard color. There would be no chance of a tangerine beard. Still, maybe next year! Here are the seeds for 2013. There are fourteen tall bearded crosses represented here! 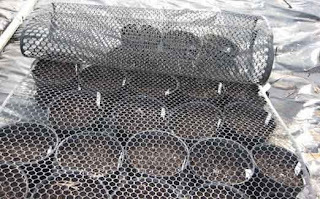 They should start sprouting by April first, and I hope for lots of rebloom. 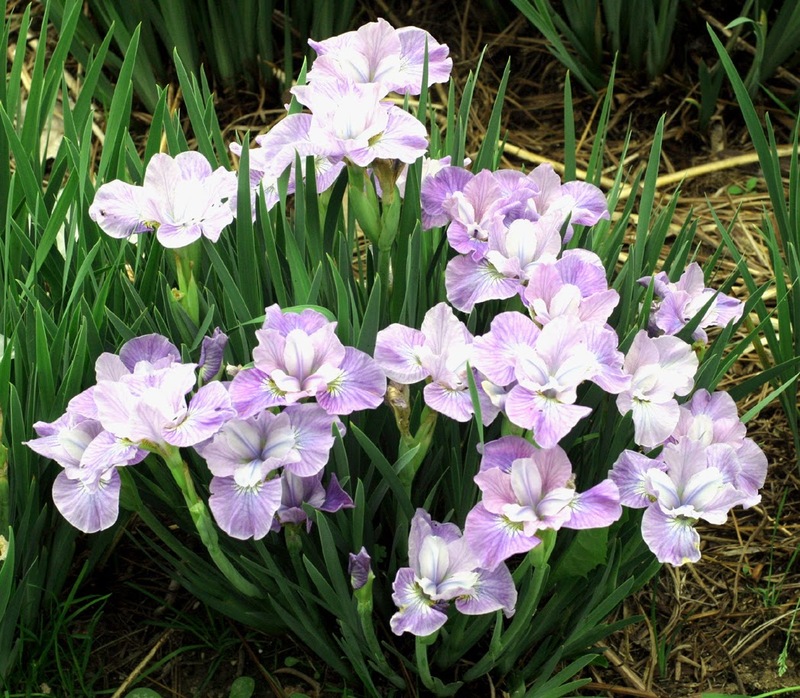 Where there are irises and hope, there could be rebloom!